When a scientist invents a serum, extracted from the bodily fluids of both humans and animals, that can recreate the “master race” of the Nazis, an American hero named Lou Mamet (Zags) travels from his native Mattituck, Long Island, all the way to North Korea, of all places, to stop the scientist. Helping him out along his way is fellow soldier of fortune (?) Ricky (Kristoff), but they’re going to have to face off against the evil Jason (Gregory) and a ton of local North Korean goons. And what does the mysterious Glenda (Siani) have to do with any of this? Thankfully, Lou Mamet and Ricky have plenty of firepower to pull off the mission...or do they? Find out today! Interestingly, Ten Zan was indeed shot in North Korea (or NoKo as we call it). This was a smart move on behalf of then-Supreme Leader Kim Il-Sung. Unlike his successors Kim Jong-Il and Kim Jong-Un, Kim Il-Sung clearly realized that the way to become a valued part of the international community and endear yourself to the rest of the world was to get Frank Zagarino in there and blow the crud out of some huts. Whether this was truly in the spirit of international brotherhood, or just a ruse to make people think they’re not a rogue state on the world stage, it was truly the best - nay - the ONLY logical move. It has been said that Kim Jong-Il was a huge movie buff and had a VHS collection consisting of thousands of titles. It has even been said that he loved action movies, the First Blood series in particular. Perhaps his love of movies culminated when he kidnapped a film crew and actors from South Korea and forced them to make a movie in the North. But the real question is: Is Ten Zan: Ultimate Mission in that large collection? Odds are it is. There’s a very good chance that a madman with nukes has seen Frank Zagarino, Romano “Rom” Kristoff, and Mark Gregory romping around in an Exploding Hutter. It truly boggles the mind. While Ten Zan doesn’t quite scale the lofty heights of the truly awesome Commander (1988) (though it would be unfair to compare every Italian Exploding Hutter to that masterpiece), we can still chalk up another in the win column for Frankie Zags. Thankfully, he’s as wooden as ever. We wouldn’t have it any other way. Of course, once again, he gets tortured. Backing him up is Mark Gregory - Trash and Thunder himself - almost unrecognizable here with short hair and very clean-shaven. The presences of those two stars amongst a panoply of exploding huts is enough right there to recommend the movie, but the North Korean connection just puts the weirdness level over the top. Ten Zan was the last film of director Ferdinando Baldi, coming not long after his Warbus (1986). We’d say Ten Zan is a bit better than the one-note Warbus, but they’re certainly cut from the same cloth. Without a doubt, there are enough blow-ups to go around. You just have to love the 80’s. It’s just so cool to see the words ULTIMATE MISSION on the screen. Ultimate Mission. You just wouldn’t see that in a movie released today. Unfortunately, the movie didn’t get wide distribution - only officially released in the Netherlands and Japan (the Japanese get everything! ), with no U.S. VHS release. That is a shame, as it could have developed into something of a cult classic - but did the North Koreans purposely prevent it because they hate America? Perhaps we’ll never know. 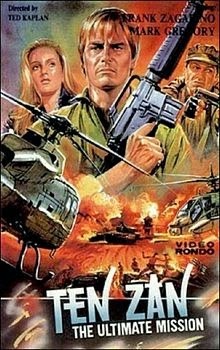 Ten Zan: Ultimate Mission is an Italian Exploding Hut movie that was filmed in a rarely-seen location, featuring some of our favorite stars of the genre. If you can see it, see it. Thanks for posting. I'll definitely be checking this out. A "NoKo" action film. What a rarity. This is a classic. How many chances does one get to see movies filmed in North Korea and produced by The Great Leader (nr. 1 of 3). Where did you find it? I have the Dutch DVD. Zags was arrested during the filming. The reason: he had a camera with him, so he was jailed for spying. Legend doesn't tell if he was subjected to Prerequisite Torture or not, but having seen thousands of action movies, my guess is yes. Exploding Helicopter: That's where we saw it! Totally worth-watching. You're going to enjoy it. Roger: We saw it on Youtube. The link is above with Exploding Helicopter's comment. Yeah, saw that trivia too. Haha, Zags was definitely prerequisitely tortured. The thing with him getting arrested was just a rumor. “That’s not true, it is a made-up story, I didn’t spend any time in prison,” Frank laughed hearing the question. “When I was there for about 9 weeks doing the film, the North Koreans watched everything I did, and once I took pictures in a warehouse and they got all crazy and upset. It was ridiculous. They took my camera, but that’s it. They didn’t do anything else”. Happy it's just a rumor and Zags didn't go to prison! Haha.